In the season four opener, Helen Magnus has pursued Adam Worth back to 1898 London to stop him from altering - and quite possibly completely destroying - the future. As she battles to stop Worth, stay hidden from her past-self, and avoid taking any action that might change the events of history, Magnus must also figure out how to get back to her own present day timeline. Magnus goes to 1898 London to try to stop Adam Worth from saving his daughter, which would alter the current time line in the Season 4 premiere. The season four premiere picks up where season three left off, with Helen Magnus (AMANDA TAPPING) standing on a cobblestone street, far from her own time or the modern Sanctuary resources. Having followed her longtime nemesis Adam Worth (IAN TRACEY) through a collapsing time vortex, she is stunned to realize they have both traveled back to London…1898. Worth is determined to change the course of his own history in order to save the life of his daughter -- even at the risk of destroying the entire future – and Magnus must track him down and stop him before he can make changes too large to remedy. Magnus’ dear friend James Watson (PETER WINGFIELD), history's greatest detective and the inspiration for the fictional Sherlock Holmes, deduces the truth about her mission, and together they must find a way to stop Worth. But Victorian London contains unexpected pitfalls for modern-day Magnus, who's frustrated by the return to a time when so many doors were closed to her. Crossing paths with her own past self, and with her star-crossed lover John Druitt (CHRISTOPHER HEYERDAHL) -- otherwise known as Jack the Ripper -- Magnus is at constant risk of unintentionally altering the timeline. And with someone murdering women in Whitechapel again, a decade after the original Ripper killings, Magnus knows more than she wishes about both the future and the past. The 13 all-new episodes of Season 4 change everything. With the arrival of the Hollow Earth refugees, the balance between Abnormals and humans is severely upset. In order to keep the peace, Magnus and team must throw out the rulebook. But forging their own way means they're not just dodging dangerous Abnormals anymore, now they've got world governments and new villains nipping at their heels. Q) Will we be learning any more of Magnus' juicy secrets this season? Amanda Tapping: Yes, yes you do actually, especially in our first episode. You get a sense of what makes this woman tick, and some of the choices that she's made and why. The whole season builds to a finale that is quite breathtaking, and it's not until the very last scene of the finale that you understand why Magnus has aligned herself with the people she's aligned herself with, why the Sanctuary went rogue from government support worldwide. But you don't ever actually figure it out, and I think people will be very surprised when they see the final ending, and what's happened. But you do, throughout the course of it, there's things that Magnus does that you go, "what, why would you, huh?" Robin Dunne: I think more than ever, any other season, I think you'll see the sort of brilliance of Magnus and the, I think she's masterminded. This season is like, more brilliant than any other time. And again, yes, at times it will be very confusing to the audience as to why she's doing what she's doing, but it will all made sense in the end. Q) Can you tell our fans a little bit about the season premiere, and what they can look forward to this season? Amanda Tapping: Well the season premiere, again, takes place in Victorian era England. It's almost a direct cut from how we ended Season 3. So we actually have, the first two episodes of the season are the conclusion to our season finale last year. And we had initially discussed doing them, sort of flashing back and forth between the two storylines, one in Victorian era England and one, what's happening in current day. And we just realized that in order to service both stories properly, they needed to be separate. There needed to be not, you know, you would need to jog the audience back and forth. So Tempus is Magnus stuck in Victorian era England, trying to hide from her past self, trying to stop Ian Tracey's character Adam Worth from altering the timeline. And the second episode, Uprising, is basically how Will and Henry and Kate and Bigfoot are trying to quell the rebellion that's happening from the insurgents from Hollow Earth. So that's how we launch. We launch the season in such a big way. We were kind of exhausted by the end of the first two, where we were like, oh God, how do we keep this up? Q) What has been your favorite experience while working on this season of Sanctuary? Amanda Tapping: ... And I'd have to say for me, Tempus, the first episode of the season, just to be back in that era, and wearing those clothes, and playing two different versions of Magnus, you know a much younger, more innocent, wide-eyed version and the fairly beaten-up version that she is now, was really satisfying, creatively. It was really fun. Robin Dunne: And also the way that episode was shot, and technologically, how you had to do it to shoot both characters. Amanda Tapping: Using stop-motion camera, and just the set was, I mean, we built this beautiful Victorian set, and then made it rain the entire time, inside the studio, which seems sort of counter-intuitive when you live in Vancouver, and we have so much rain outside. But we, yes, it was just a really, very cool and soggy. Q) In the season premiere, Tempus, we see Helen Magnus really lacking in emotional control. In the past, whenever she's gotten angry she seemed to channel it into a determination and focus to solve the problem, but here she really loses her temper and she's really kind of a fury. What is it like playing that unleashed version of Magnus? Amanda Tapping: It was interesting to play, because I was afraid that it was getting too dark, but what was explained to me, and what I finally worked through is, she has to, at all cost, as callous as it seems at times, and as full of rage as she seems at times, she has to, at all cost, stop Adam Worth from altering the timeline. A) because her present, and all the people in it, could potentially be destroyed, but also the fate of the world is in the hands of a madman, who now has technology far advanced of what's available in Victorian era England, and can literally change the course of human history. So the stakes are massively high, and it's also very emotional because she's dealing with a younger Watson, she's trying to hide from the younger version of herself, she's dealing with what it's like to be a woman in Victorian era England, she has to deal with John Druitt in a pretty ugly way, and gets again a sense of, firsthand of what it was like to be with him back then. So it's an intense episode and, yes, there are times when I'm like, man, she is nasty. But when you realize what's at stake, and it literally is the course of human history that's at stake, then you understand why she loses it. And I think she's so far out of her depth, she's so far from home and, ultimately playing in the back of her mind is, "How will I ever get back to my present? How is that even possible?" Q) Speaking of Druitt, I thought that the revelation regarding him was rather spectacular, and kind of key to the way people have been understanding him, both in the show and viewers. What was it like when you read the script and saw that was what was happening? Or did you have some input into that before the script was finished? Amanda Tapping: Well we actually sit down before the season starts, Martin, Damian and I and the writers, and sort of log out what we'd like to see happen, certain character twists and turns, but then it's really in the hands of the writers. And Damian wrote this episode and, as usual with his deft touch, he'll find a turn that nobody sees coming. And so, with Druitt, it made sense that we saw this man at this point in time, I mean it's right in the middle of the Ripper killings in Whitechapel, and we, it was important to service that element of his character. So it was shocking to read the script, but by the same token, it's just another revelation, right? It all helps you understand the character a bit more, and it helps you, in some ways, choose sides a bit more. So, we may map out as much as we can, but then the writers will always throw little curve balls in there that no one sees coming. And that's kind of what I love about getting a fresh script is, okay we've talked about this, but how is it going to happen? Fan Question : We have seen your a lot of your character interact in many different ways with Magnus over the seasons. First as kind of an enemy and then as a sort of kind of sometimes ally and I was wondering where you see that going because we've had when the whole energy monsterr came out he was a really nice character and I was wondering maybe nice John is going to come back?? Cris H : Nice John is always there. Sometimes he loses the battle withe evil John. Umm what we're going to see in Season 4 is a side of Magnus and a side of Druitt that we've really never seen before, an expression of their relationship that I think will be umm..
Chris H : yeah, I think you'll enjoy it. It's the first episode and so you definitely want to watch the first episode because you're going to get a lot of surprises in many relationships. Oh I'd love to tell you more, it's fantastic! AT : We started with Tempus which is an episode that takes place in Victorian era England and it's massive in scope. We shot it all in the studio with rain falling down, full costume; it was beautiful, absolutely beautiful. Josh : can I infer from the cliffhanger at the end of Season 3 are we going to be doing a lot of period stuff in Season 4? AT : we do some period stuff in Season 4 obviously we end Season 3 with Magnus landing on the cobblestones in London Victorian era and so we have to address that. Um it's very clever and it's the first episode of the season and it's called Tempus and I think it's one of our finest in terms of just the look and the stunts. I do an amazing fight in a bustle that I'm very proud of. Fan question : Since you go back to Victorian England are we going to see any more exploration of helen's and John's relationship or maybe Jack The Ripper at that time next season? AT : Yes. (then stops and doesn't say any more) (Audience laughs) Yes, the episode Tempus will answer many questions for you in that regard. The interesting thing is is that, now that I've blown it, there's basically two Helen's in that timeline right? so you do see Helen's and John's relationship in a very harsh light and you do see ah.. it's very much around the time of The Ripper killings so... ... Yes. (audience laughs) But if you would just keep that in this room (audience laughs) that would be great so I don't get in trouble with the producers. oh! pffft! (audience laughs) (Amanda has mock conversation with herself) Naughty, naughty girl! - Yes, I know. (audience laughs) Yeah, so if you could not Tweet that or you know that little social network or intra web thing that's out there now, if you could just stay off that for a little bit, that'd be great. "We do some period stuff in Season 4," Tapping teases. The "Tempest" episode will reveal Helen and John's relationship "in a very harsh light" and it very much takes place during the Jack Ripper killings. There will be two Helens in that episode, Tapping revealed. THR: What’s coming up during Season 4 of Sanctuary? Tapping: We painted ourselves in an impossible-to-get-out-of corner at the end of Season 3 and we start in a time and place that is very special to my character [Dr. Helen Magnus], but is rich with history and stories. I directed the second episode and Robin Dunne directed the sixth episode. We do an episode on a tropical island. We do an episode on an ice breaker on the Behring Sea. 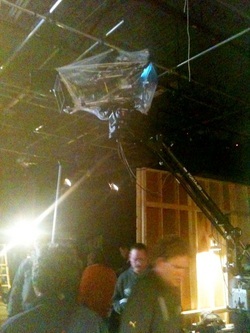 The Victorian era episode, it was raining inside the studio. You’ll see a great directing turn from Robin Dunne. I was so happy with the Adam story line because that, well it gave us someone to really hate. That is the pay off of that entire through line, it is to the point where at the very last moment of it you are viscerally feeling his fate. It was gorgeous and it is exactly like everyone was rehearsing, getting their chops loosened up for that episode and bang, you know the story came together Martin's vision of how to put it together was there and Amanda's performance was literally on a level I've never seen before, it was astonishing. That sort of set the bar and made everyone excited and that got everyone kind of so inspired as we kept going forward. Also the second episode is directed by Amanda and it's so deft and action packed and well done and I'm just, we're very chuffed about our season so far. Q2 - Kat Tennant - What is it like working with Peter Wingfield? A2 - Simply smashing. I adore him. We just shot a huge episode together for season 4. It's just so safe and so lovely. Another crazy day - rain, rain, rain. Not unusual in Vancouver, but this was inside! #Sanctuary production meeting today for new season 4 episode. Cool visual effects, special effects and makeup effects in this one! Read thru was FAB! This is going to be a terrific ep. DK at his very best. And Martin directing Can't tell you who is in it tho'...intrigue! Amanda: and it's a conclusion, the first two episodes coming back of Season 4, a conclusion to our big, old cliffhanger. When I read the ending of episode 3-20 I was like "No way! That's so cool!" then what? How do we get out of that? Diane: [Laughs] Great, but you're not going to tell me are you? Amanda: I'm not, I can't. Diane, come on! Diane: How do you get back into character after hiatus? Has this one been long? Amanda: Yeah this one has been actually. This one has been longer than we would have liked. We would have liked to come back shooting a lot sooner than we did but we were off basically from October November December January February March like 6 months essentially. And in that time I've done a lot of travelling, spent time with my family and Mahnus is such a weird, she's such a weird gal, I mean I love her but she's very excentric and it's not just getting into the voice and wearing high heels again there's a whole sort of shift phsychologically to try to play her, not that I carry that shift home with me but you know what I mean? I kind of have to, every scene I have to wrap my head around this woman and go alright OK umm but she's coming back from a little bit of a different perspective at the beginning of this season so it will be interesting to see how they write this slightly altered Magnus.